With all of the options available, choosing a new siding for your home may seem like an overwhelming task. Vinyl siding has a lot to offer that other siding materials don’t. It’s just as functional and smart as it is aesthetically pleasing. Whether you’re trying to give your home that traditional look or hoping for a more functional purpose, you should consider vinyl siding for your home. Vinyl siding is a durable siding option created from high-quality vinyl. Most commonly, it’s made to imitate the classic wooden, clapboard siding. However, there are countless different options available. Vinyl siding has become more popular across the United States for a number of reasons. There are many benefits to opting for vinyl siding that you may want to consider when deciding how you want to renovate your home. You’re probably wondering, what makes vinyl siding so great? It’s the most durable, energy efficient, versatile option available. We’ll go more in depth with all of the benefits of vinyl siding below. You can do a lot with vinyl siding. The possibilities are virtually endless. With so many different shapes and colors to choose from, you’ll be able to make your dream home in a switch. Do you like the classic wooden siding? There’s vinyl siding that looks like that. Do you prefer a scalloped, Victorian style siding? This is also an option. Vinyl siding options leave a lot of room for customization and the vinyl siding imitations are almost indistinguishable from the original – even to discriminating viewers. 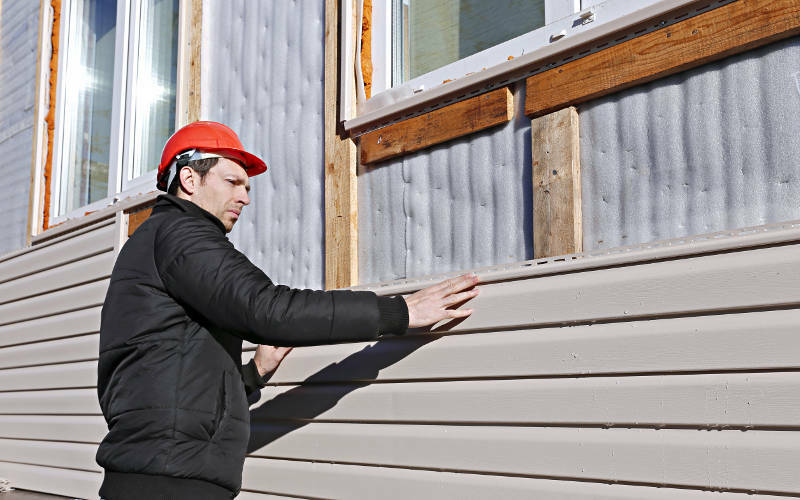 Vinyl siding is built to last and very easy to repair. The material is built to withstand all types of weather including – but not limited to – rain, strong winds and hail. This makes it a great option for Quad Cities homeowners who live the weather is unpredictable. Additionally, it’s built to withstand large amounts of moisture without rotting or corroding away like traditional siding. On top of that, because it’s not made out of wood, it can resist pests such as termites. For the busy people out there, it can be important to note that vinyl siding is virtually maintenance free. Because it’s so durable and greatly reduces the chance of getting termites or rotting, it keeps its original looks for years without any problem. A simple wash every year is all that’s recommended, saving you a lot of time and money when you want to keep your home looking at its best. Investing in vinyl siding can reduce the cost of your heating and cooling bills each month. Insulated siding keeps the heat in with the process of thermal bridging. It creates a protective barrier over the studs, trapping in the heat and making sure it doesn’t leak out. It also keeps the outside weather from getting into your home, which is great for keeping your home cool year round. Depending on where you live, having vinyl siding may even allow you to file for energy tax credits! 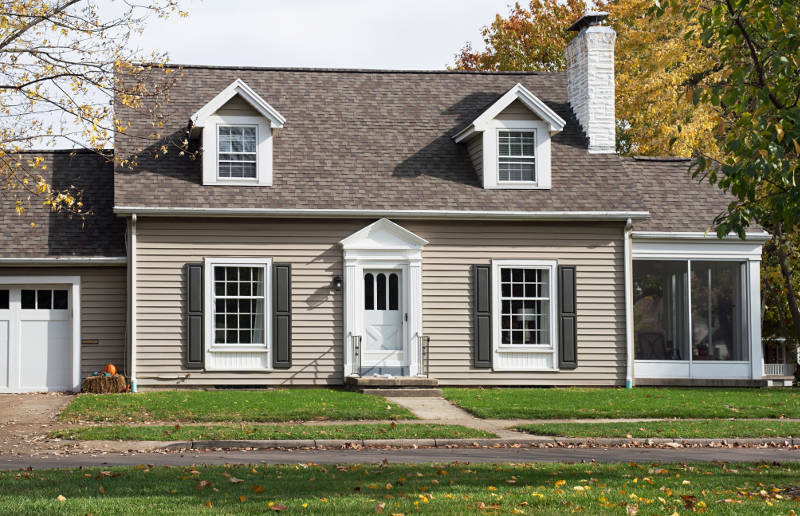 With the money that you save in maintenance costs, heating/cooling costs and the possibility for tax credits, it’s no surprise that vinyl siding would be a good long-term investment. Better yet is that it’s actually the less expensive option from the start. Often, the costs of buying and professionally installing vinyl siding can cost up to a third less than wooden siding! If you decide that vinyl siding is the option for you, there are a few things to look for when trying to find a good quality product to invest in. The thicker the better when it comes to these panels. Thicker products tend to be more durable than thinner counterparts. Average thickness of these panels are about 0.045 inches. A thicker product would run around the lines of 0.05-0.055 inches. Having double hems also contributes to the durability of this product, allowing it to be less prone to sagging and have greater wind resistance. Having a foam backing adds to the durability of the product as well as gives it a flattering look. Additionally, the foam allows for enhanced installation, keeping your house warmer in the winter and cooler in the summer. Although the panels are relatively easier to install, it’s a wise decision to invest in professional installation. Look for contractors who are experienced as they can offer you the best way to install them so they look nice and will last. You can even check to see if they have some special certifications to prove their skill. The higher the rate, the better. This is the measurement used to determine how much wind the product will be able to handle. For people that live in areas prone to tornados or hurricanes, this can be especially important. Longer panels have far less seams than short panels. While typical panels are about 12 feet long, there are panels ranging from 16 to 25 feet than can offer a better look. The lap profile depth refers to how much the panels stick out. The farther, or deeper. They are, the larger shadow they’ll cast. Those that cast bigger shadows offer a more convincing, “real wood” look. There’s no doubt that if you live in the Quad Cities and need to replace your home’s exterior, vinyl is the way to go. Not only is it durable, but it’s also energy efficient and beautiful. There’s no better option on the market. Feldco is here to help you with your vinyl siding project. We’ve been serving the Midwest for over 40 years and guarantee that your siding will look great and be installed perfectly. Get a free quote now and see why over 350,000 homeowners have trusted us with their home improvement projects.